The organization challenges began even before my babes came home from the hospital. I remember the first clothing item I bought for the babies – a Winnie the Pooh three piece outfit, neutral in color since I wasn’t sure of the baby’s (singular at the time) gender. It was all downhill from there as I learned to enjoy shopping in “both sides of the store” and my Mom and Mother in Law also rekindled their passion for baby clothes shopping. The best description I can give is that I am a “baby clothes trafficker” with new clothes coming in (fresh from the clearance racks) for future seasons, clothes too small into the keep pile, clothes heading for kids consignment sales, and of course – piles and piles of laundry. Sometimes I feel like I can barely keep up with it all! Despite the struggle, I’ve found a few solutions and strategies that have been helpful for managing their wardrobes – past, present and future. Just as how their clothing is just too much to tackle in one day, our system is too much for even one post to handle so we’re going to break it up a bit. First, we’ll cover the “retired” baby clothes. Clothes that have been retired from our closet have three categories – each with a designated place in the babies’ bedroom. 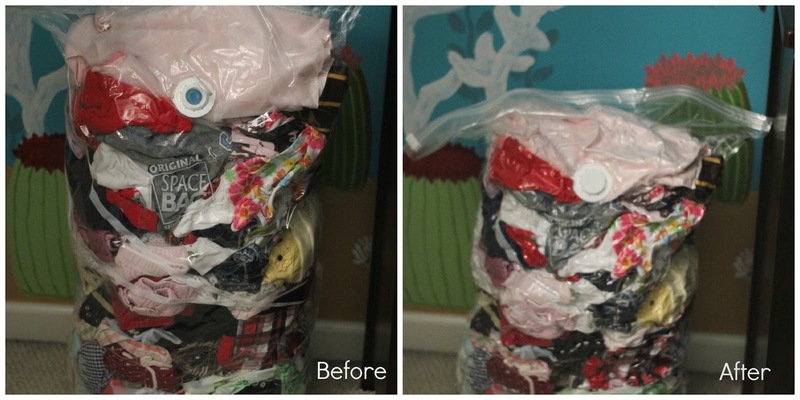 “Clothes to Keep” go into a giant Space Bag which holds an amazing amount of clothing. While I use the smaller sizes for other things (like maternity clothes) the XL Cubes are perfect for baby clothes because when filled they are self-standing and can sit upright. In a year and a half, we’ve filled three, and they are happily being stored in our garage. While we’ve considered pre-sorting this by size and gender for our future “hope baby,” it’s just too much in an already overwhelming task so we let it be. Here is our before and after! It’s amazing how these guys shrink down after you vacuum the air out! “Clothes to Sell” for kids consignment sales remain on the hangers (or stack folded if coming from a drawer) and are placed into a waiting laundry basket exclusively for this purpose. When the basket is filled, the contents are moved to the basement, where our old luggage will store the garments to be sold. They’ll be tagged, sorted into sizes and repacked. Out suitcases are perfect for hauling the clothes to our Mothers of Multiples sale where last time I made over $300 in sales! Clothes with Stains have a box all their own, and get a few last attempts at salvation before heading to the rag bag. I’ve learned quite a bit about stain removal, but absolutely hate to give up on something I want to keep or could get a few dollars for at a sale! 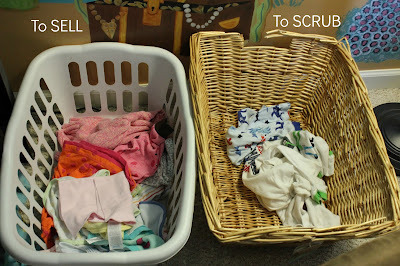 Keep an eye out for our next post in the baby clothes management series on how we handle current and future clothes! Click to vote? Pretty please?